Published in the series, Sociology of Crime, Law and Deviance, Volume 19. Bingley, UK: Emerald Group Publishing, October 2014. This volume in the series Sociology of Crime, Law, and Deviance deals with aspects of punishment, especially concerning incarceration and prison conditions, in a variety of countries. The book brings together scholars to contribute their respective chapters, each of the authors drawn from various parts of the world, thus ensuring a global perspective on the basis of the authors’ unique specialties and national settings. The countries whose prison and punishment conditions are analyzed specifically include Italy, Turkey, England and Wales, Belgium, Canada, Mexico, the United States of America, South Africa, Japan, and Hong Kong. 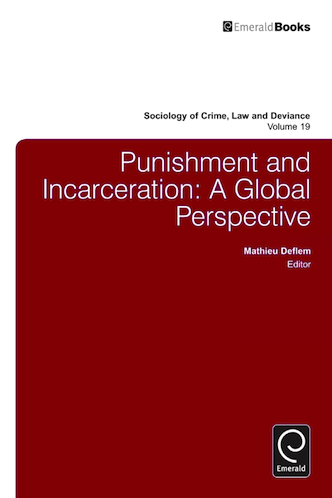 Both thematically and regionally diverse within the province of social and behavioral studies devoted to the study of punishment and incarceration, the chapters in this volume also demonstrate the value of multiple theoretical approaches and methodological orientations in uncovering the realities of punishment and imprisonment across the world. This volume is published in the series, Sociology of Crime, Law and Deviance. NATIVE AMERICAN INCARCERATION: A NEGLECTED PROBLEM? Physical copies of this book can be obtained via internet stores or through resellers.